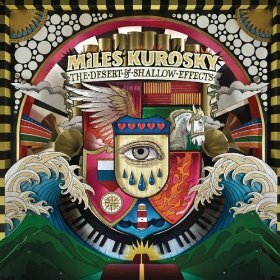 First Look: Miles Kurosky – "The Desert of Shallow Effects"
Miles Kurosky, thank God, remains incapable of writing a bad song and staggeringly capable of writing great ones. The former Beulah frontman spent the seven (!) years following Beulah’s 2003 swansong, Yoko, in and out of the hospital and slowly piecing together his solo debut, The Desert of Shallow Effects — a long wait, and one that couldn’t help but come with expectations. But Desert is a stellar record, as good and weird and unaffectedly catchy an indie-pop effort as the genre’s seen in recent years. Yoko was an uncharacteristerically heavy record in both sonics and emotions, a weight that seems to have lifted from Kurosky’s shoulders in the ensuing years. Desert finds him stepping out into the great outdoors and romping on the Beach Boys’ California shores again. “Notes from the Polish Underground” and “An Apple for An Apple” kick off the album with pillowy arrangements and punchy guitars, respectively, while the easy folk of “She Was My Dresden” nods back to Beulah’s sunny peak, The Coast Is Never Clear. “Pink Lips, Black Lungs” is the closest Miles is likely to come to dance-punk, but a familiar burst of horns brings it squarely back to Beulah territory. Alternately edgy and chamber-pop soft, Desert’s coiled-up song structures and instrumental surprises comprise Kurosky’s most ambitious work yet. More importantly, though, his progression hasn’t come at the cost of the richly rewarding guitar-pop that’s always been at the core of his music. He’s all dressed up with everywhere to go.